Home » Perry County Council of the Arts; Upcycled Art! Perry County Council of the Arts; Upcycled Art! The Perry County Council of the Arts is featuring some imaginitive artwork with their Upcycled Art Show! 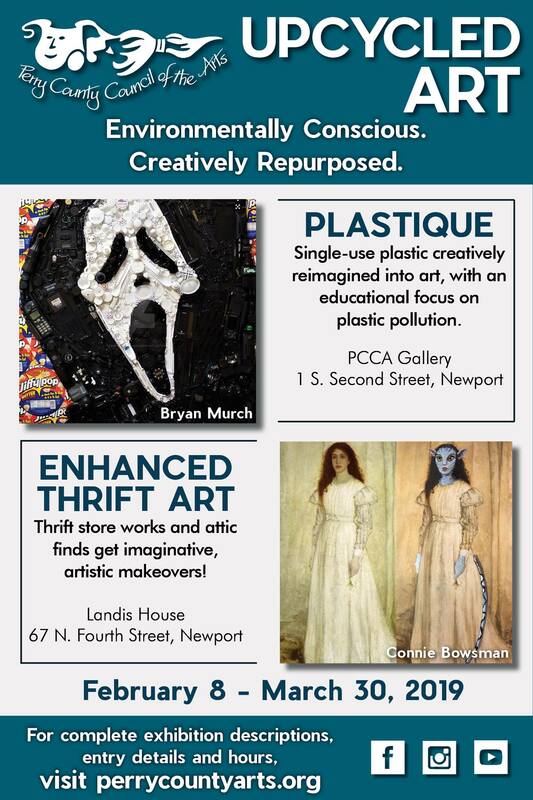 Their first shows of the New Year include Plastique and Enhanced Thrift Art, both on display February 8 - March 30, 2019 in Newport, PA. Artwork entries are still being accepted. Plastique: Plastique is a group showing of artwork in a variety of media, created with single-use plastics that would otherwise enter landfills, and our oceans and river ways. Contribute your creations to this imaginative and environmentally conscious art show that will not only entertain and inspire, but will also educate about the environmental harm of single-use plastics. The goal of this exhibition is to salvage plastic waste and upcycle it into art. Please do not purchase new plastic components to create your art pieces. Entry deadline is February 2, 2019. Enhanced Thrift Art: Enhanced Thrift Art is an exhibition of artwork, with each visual art entry beginning as a piece of art or article found at a thrift store/yard sale or in your long ago forgotten storage area. The goal is to give neglected and abandoned art a makeover. You may draw on it, paint on it, collage on it, sew on it, or cut it up. Make it your own! We are looking for two-dimensional and three-dimensional entries that include, but are not limited to pictures, sculptures, clothing, or jewelry. Entry deadline is January 25, 2019. For more information on the exhibitions and submission guidlines visit perrycountyarts.org.